Deliver current to an air carbon arc electrode and control its position using these handheld torches. The electrode is inserted in the torch's jaws and brought near the metal workpiece to generate a carbon arc that cuts and melts the metal. The torch is connected to a power supply that provides current and a compressed air supply that delivers a jet of air to blow away the molten material. 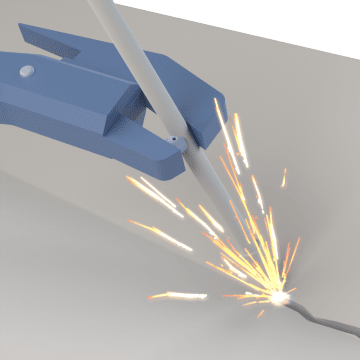 Air carbon arc cutters efficiently remove layers of material from the surface of a workpiece without damaging the underlying material. They can be used to gouge or cut steel to remove a defective weld, prepare a joint for welding, and more.